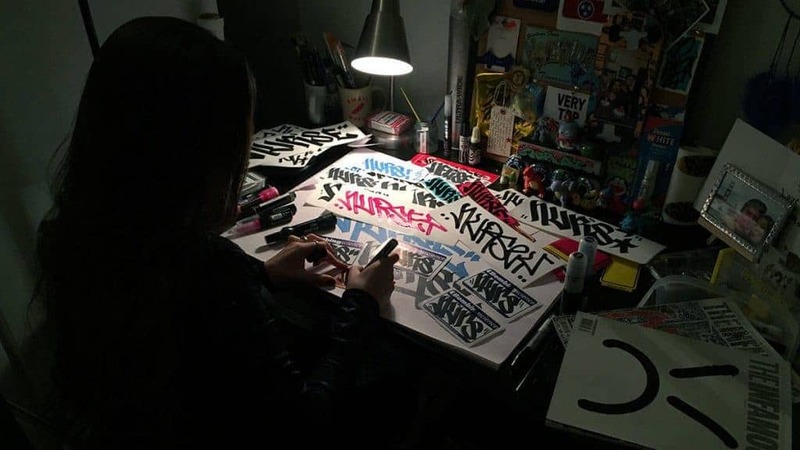 Artists from all around the world are constantly developing their handstyles in order to out-do each other when it comes to technicality & originality. It’s then easy to forget about the foundations of a letterform in a handstyle, and therefore makes it super refreshing to see a clean style executed so well. Nurse, a writer from Toronto, is a great example of the latter, bringing a fat chisel style to the table that could send many writers back to the drawing board with their markers in hand. Whilst Nursey Q is extremely talented with a chisel tip, she isn’t afraid to use those hands on any other tool she can get, from mops, Ultrawide cans, spray paint, & even engravers. Nurse was also kind enough to take the time to sit down in her studio and bust out a video of her putting her hands to work – so be sure to check that out at the end of the interview. Additionally, to go with the launch of the video and interview, there are 5 Handstyler X Nursey Q sticker packs available in the Handstyler store, so be quick and grab one before they all go! What do you write and where are you based? I write Nurse, also called NURSEYQ, and I am based out of Toronto, Canada. How long have you been writing graffiti for, and what sparked the interest? I was first interested in graffiti when I turned 14. I remember seeing tags on my route home. One night my father and I were out for a walk and I asked him about the tags and he explained graffiti to me. After that, thoughout the year I had met other people at school that sketched graffiti… never stopped since! Were you into doing any cursive or calligraphy before doing graffiti? I had always done art, never really into calligraphy beforehand, but when I look back at my childhood art I realized most of the stuff I drew included letter. I’m definitely more into calligraphy now that I’m older. I think that knowing the form of letters are very important to improving your hand styles and letter structure. Within your home city are there are any other writers to look out for that push quality handstyles? Causr, Engine, Dloe, Trik, Fario, Forte, Savoy, Wolfe, Rons, Mosher. Some good tags around the city to watch out for. What have been you inspirations on your style, both inside and outside of graffiti? The typical, “You’re good for a girl” comment has given me inspiration since day one. Poster art, cute characters, comics, animation, simplicity, logo design, travel, american graffiti has always been a big inspiration. Are there any other female writers you paint with, or do you mainly paint solo? No other female writers from the city that I paint with. I have a small group of friends and normally just stick close to when I paint. Are there any artists featured on Handstyler that have caught your eye? Sicoer, Renos, Poster etc.. You have a good eye! Super Black Chartpak marker – it always makes crispy lines, even when its running out of ink. Are there any tips you’d like to give to any of the readers on building their style? Building your own style takes time. I believe that studying photos, pieces, tags, alphabets, or drawing something over and over again is key. Draw everyday, even if its for a few minutes – it keeps your mind fresh. Style develops over time. Never rush! Where can readers find more of your work online and follow your progress? My Instagram and Tumblr or by email. I also have a small site I post work on sometimes. What’s one song you’d recommend everyone to listen to whilst checking out the rest of your stuff? Handstyler, Grog, Eggshell Stickers, Mosher, Savoy, Tim North, Mom, Dad and my boyfriend Morgan. Check out Nursey Q’s video below, and be sure to follow her on Instagram.